Harvard Business School historian Nancy Koehn discusses her book about leaders who overcame adversity to leave a lasting mark. That was the genesis. How do we navigate through crisis? How do leaders? Because this was so clear in Lincoln’s case. 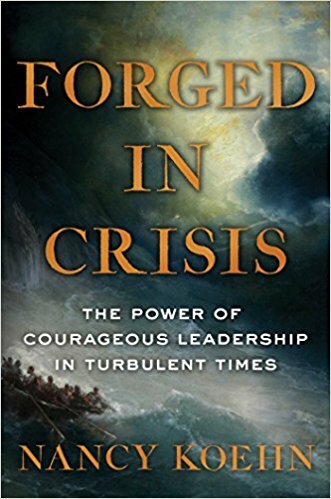 How do leaders not only navigate and lead their followers through crisis, but how do they become better, stronger, more embracing of a worthy purpose with more access to their muscles of moral courage? I thought that was such a compelling question. That was really the beginnings of the book. Then I found these other four fascinating people with their jaw-dropping, gripping stories, and I was off to the races. Kohn: Let me give you one example that still stays with me. I use it in my own life to steel my own muscles of courage. Douglass was a strong, very intelligent, very resourceful teenager who couldn’t stand being a slave. His owner sends him off to a man named Edward Covey, who is known as a slave-breaker. These were people whose job it was to intimidate slaves into more docility and more subservience through both through physical violence and emotional abuse. Owners often sent recalcitrant black men to these people. Koehn: Oh, I think he was. I think he’s one of the most important leaders in American history. The book makes the point that these two leaders of the five, Abraham Lincoln and Frederick Douglass, ended up working for a common purpose to end slavery. They came to know each other, and they came to respect each other. She searches around for her next project and bumps into the issue of pesticides that are being used in huge, largely untested ways by farmers, big chemical companies and for household use. The more she learns as she puts on her detective cap, the more anxious she gets, the more concerned she gets about the possible effects of this. A bit like lots of things we’ve discovered about chemicals and environmental dangers in our own lifetime. “While some may be born with an innate knack for great leadership skills like confidence, communication, and creativity, I’d like to argue that great leaders are made not born. Even if you are born with certain traits and talents, only through carefully developing those skills and talents can you learn to master the art of leadership. Being a great leader takes practice. To develop great people skills, potential leaders need to learn how to become better listeners, how to accept critical feedback in a constructive way, and how to best display empathy and patience with other team members and colleagues. Confidence is also a huge part of leadership, and is a trait you can practice and hone over time. Confidence and self-esteem come from interactions where we (in our own eyes) behave positively. We can exercise this through becoming more decisive in our work and personal lives, learning more about our industry so we become knowledge experts, and building our own success rather than waiting for others to hand it to us”( Allen Kors,Great Leaders are Made, Not Born, LEAD ON PURPOSE). “Emotional Intelligence is the cornerstone of effective leadership. Just like any other skill set, emotional intelligence is learned over time. Leaders are at their best when they possess a healthy combination of self-awareness, self-regulation, social skills, motivation, and empathy. These skills are absolutely fundamental to effective leadership. What’s clear is that no one is born having fully mastered any them. In fact, we only learn them vis-à-vis our relationship with others. Through observation, interpretation, interaction, and taking action, we establish a greater understanding of what these things mean. We reflect, evaluate, and conclude. Right, wrong, or indifferent, we also make decisions based on the knowledge we acquire in this process. If you’ve ever questioned the evolution of leadership, it’s understandable. Theories and researchers have pondered it for hundreds of years. But, from a practical perspective, consider this: if we’re not born with it (and we aren’t), all signs point to it being a skill—one that is learned and developed over time. #GotLeadership #GetLeadership”( Karima Mariama-Arthur, Here’s Why Leaders Are Made, Not Born Studies show that real leadership skills come from experience,BLACK ENTERPRISE wealth for life). Of course, everyone you meet has different values, opinions, attitudes, beliefs, cultural values, work habits, goals, ambitions, and dreams. Because of this incredible diversity of human resources, it has never been more difficult and yet more necessary for diplomatic leaders to emerge and form these people into high-performing teams”. ( Brian Tracy,Leaders Are Made, Not Born,BRIAN TRACY INTERNATIONAL). “On the “leaders are born side” we know that extroversion, conscientiousness (i.e. planful, achievement-oriented, reliable, persevering), openness to new experiences, emotional stability, and general intelligenceall contribute to a foundation for leadership effectiveness. These characteristics have been shown to be helpful across organizations, sectors, nations and organizational levels, and are often the focus of formal questionnaire-based assessments of leadership potential. On the “leaders are made side”, in-born characteristics make it easier and more natural to seek out experiences that build a repertoire of leadership competencies. These include the development of written and oral communications skills, the confidence required to inspire and influence others (“charisma”), social adeptness and cultural intelligence. These talents are most often measured through interviews and simulations of typical leadership tasks (e.g. conducting a mock performance review, conducting a coaching session; prioritizing and delegating a set of projects; making an inspirational speech; and resolving scenario based management dilemmas)”( Dr. Rick Hackett, Are leaders born or made? DeGrooteSchool of Business). As a history buff I am eager to read this book. But as a student of psychology I am unconvinced that leaders are made not born. “Forged in Crisis” is an apt title. Like iron at a forge the metal has innate characteristics which allow it to be shaped for many purposes. Bandura’s concept of Reciprocal Determination is in play. The interaction of a person (including predispositions to certain attitudes, behaviors & cognitive abilities), his/her behavior and the environment shape/reshape each other in turn. The position that leaders are made not born takes the person out of Bandura’s equation, leaving us with the less sophisticated, person as blank slate, explanation of behavior advanced by behaviorist like Watson.